What is a Trickle Battery Charger? 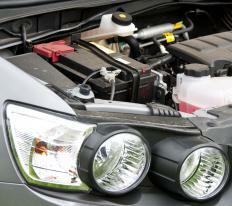 Car batteries typically discharge naturally over time and may require frequent recharging. A trickle battery charger is typically meant maintain a steady level of charge, rather than replenish a totally dead battery. The main uses for this type of charger include maintaining a battery when a vehicle isn't driven regularly, or keeping a battery warm and fully charged overnight in very cold conditions. They usually accomplish this by providing a level of charge that is very similar to the rate at which the battery naturally discharges. Overcharging a battery can ruin it or even cause an explosion, so a trickle battery charger should usually be monitored to avoid this. Car batteries tend to discharge naturally over time, and may lose their charge even faster due to drains, such as those from clock radio memories. This may not be noticeable when the vehicle is used regularly and when the battery is in good condition, as it will tend to be replenished by the alternator during normal driving. Vehicles that are stored for extended periods of time, however, may fail to start due to this natural discharge. Utilizing a trickle battery charger on vehicles like this may allow them to be driven without incident when required. The slow maintenance charge provided by a trickle battery charger may be better in the long term, than allowing a battery to completely discharge repeatedly. Due to the design of the typical lead acid battery, repeated discharge can damage the plates. Float chargers may be attractive due to the protections they typically include against overcharging, but constant charging can ultimately damage the electrodes within a battery. Damage caused by repeated discharge and constant charge can both lead to premature failure. A trickle battery charger may be best used by only connecting it once every couple of weeks. This can prevent deep discharge of the battery while also avoiding damaging sulfation. Simply driving the vehicle a few times a month may also help maintain the battery charge if obtaining a trickle battery charge is unreasonable. An exception to typical lead acid batteries are the deep cycle batteries that are often used in boats, golf carts, and recreational vehicles. Unlike most lead acid batteries, a deep cycle battery is specifically designed to discharge without being damaged. Using a trickle or float charger on one of them may actually do more harm than good, as they are designed to undergo a state of deep discharge before being returned to a state of full charge. What Is State of Charge? What is a Smart Battery Workshop? How do I Choose the Best Automotive Battery Charger? How do I Choose the Best Lead Acid Battery Charger? How do I Choose the Best Golf Cart Battery Charger? How do I Choose the Best Marine Battery Charger? How do I Choose the Best Portable Battery Charger?